Carbon Capture and Storage (CCS) is the process whereby the combustion of fossil fuels is modified so as to capture the bulk of the CO2 that would otherwise be emitted, compress it, transport it, and then store it permanently in geological formations underground (or under the seabed). CCS has been identified by policy-makers at the European and global levels as an important option to help achieve a low-carbon future without creating substantial economic or environmental dislocations. 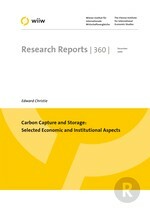 The study provides a general overview of CCS and of related economic and institutional challenges ahead of its probable commercial deployment. In particular, cost estimates for the main components of the CCS value chain are reviewed with reference to the McKinsey report of 2008. The economic geography of plant location and CO2 pipeline investment needs is also mentioned. Institutional challenges are then addressed, notably with reference to the EU ETS and to the (so far unsuccessful) inclusion of CCS in the UN's Clean Development Mechanism (CDM). The study then takes a step back and re-visits the issue of coal reserves and their geographical distribution. The study concludes with a short review of existing CCS pilot projects and a summary of stakeholder views.